I have seen this beautiful effect so often on pictures but never found an understandable and easy recipe which really worked. 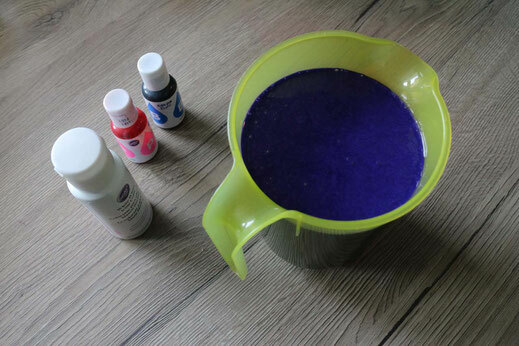 After many trials which did not work out so well I nearly gave up, but I'm glad I went on and now I'm able to show you this step by step tutorial. This time I added a crunch layer to the cake itself. 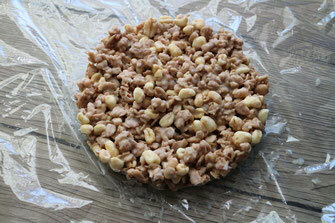 For this you mix 50g of cereals with 50g of melted white chocolate and fill it in a small silicon mold which was layered with plastic wrap. Freeze for about an hour before you bake the rest of the cake. 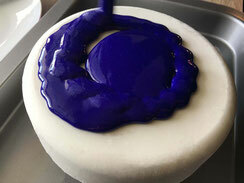 I always use variants of this nobake cheesecake which I fill into a silicon mold. 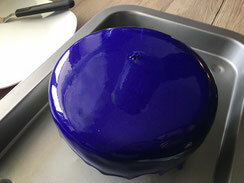 This time I added the crunch layer before freezing the cake to prepare for the mirror glaze. 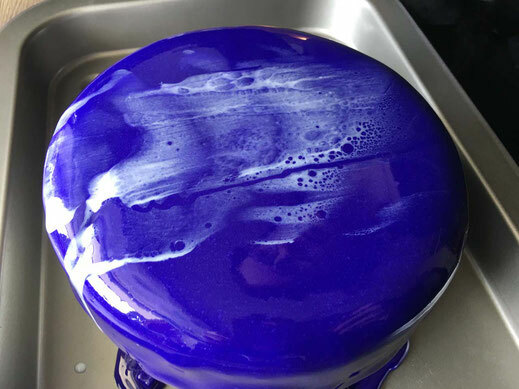 After the cake is completely frozen you can prepare the mirror glaze after this recipe. 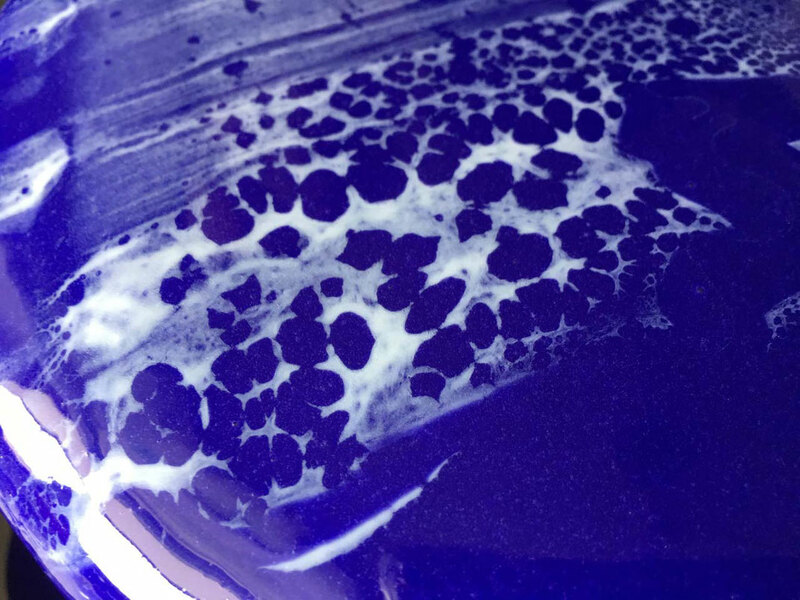 This time I dyed it with pink and blue food color and for having it less transparent I added a drop of white color as well. Now let it cool down to about 40-42°C. 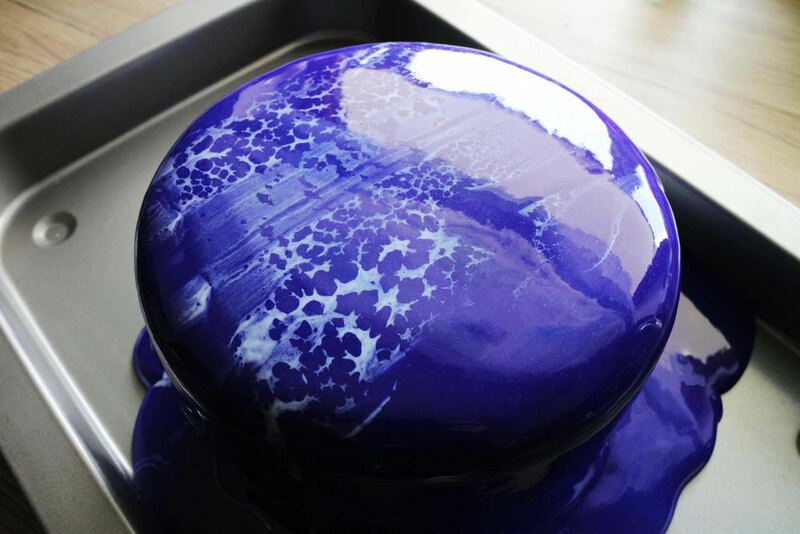 While the mirror glaze is cooling down, you need to prepare the second component for the leopard or spider web effect. 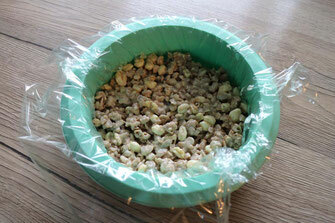 I used for the a cup heater, but you can also heat it over a bain-marie. With the cup heater its so easy to keep it on the correct temperature without having to pay much attention and you can fully concentrate on the mirror glaze itself. For the effect I used ready to use white glaze form Silikomart mixed 3:1 with water at a temperature of about 60°C. Don't get confused by the higher temperature on the cup heater. 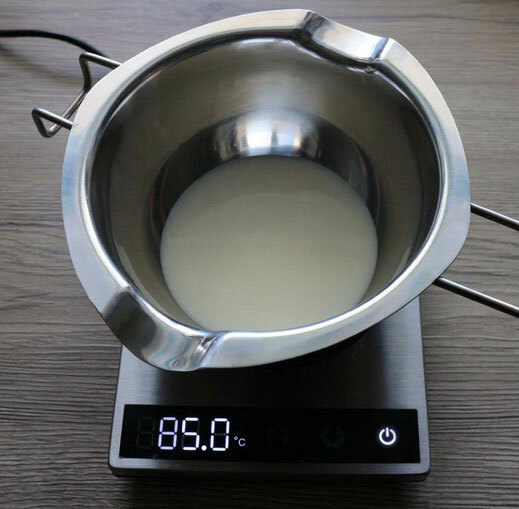 Because of the heat convection the temperature of the white glaze will be different as on the heater, which you can check with a thermometer. The good thing with the cup heater is once the glaze is at the correct temperature it stays constant and you don't have to worry anymore. 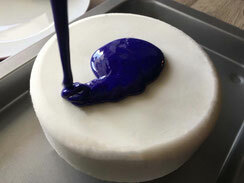 After the mirror glaze reached the correct temperature you can unmold your cake and pour the glaze over the cake. 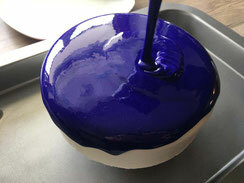 Now you need to be quick and spread a layer of white glaze immediately over the mirror glaze. You will see the effect developing within seconds. On this picture you can see how it's just happening.